Influenza, otherwise known as the flu: perhaps one of the most well-known illnesses out there. And it’s no wonder why. Countless people come down with this condition every year. While most of those who contract influenza will recover from it, it can cause complications for some people. 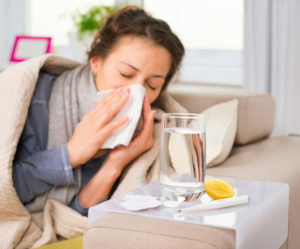 At Prime Medical Associates, we can help those who are suffering from the flu get the help they need. We’ll help reduce your discomfort and do everything we can to help you heal from this illness as soon as possible. Influenza is different than what is commonly known as a “stomach flu.” It is caused by a virus that affects your respiratory system. Therefore, antibiotics will not help cure the flu. 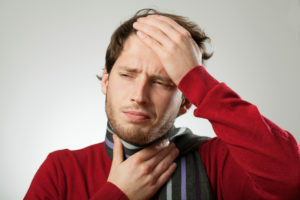 The symptoms can at first mimic those of a cold, but the flu generally progresses much faster than a common cold does. When you come down with the flu, there are some hallmark symptoms that you might start to notice. These include a runny nose, sore throat, fever, cough, headache, body ache, and chills. If you start to experience these symptoms, you should make an appointment to go see a Dartmouth, Massachusetts, doctor right away. Anybody can catch the flu. It is a contagious virus, so it is likely to spread between people in close personal contact. However, some people are more at risk for complications of the flu. These people include young children under the age of 5 years old, older adults over 65 years of age, pregnant women and women who have just given birth, those who live in nursing homes or in other highly populated living situations, those with weak immune systems or who suffer from chronic illnesses, and people who are obese. If you fall into one of these categories, you should take preventative measures to lessen your chances of contracting the flu. The doctors at Prime Medical Associates suggest that those at risk get a flu shot every flu season, which is around mid-fall. However, it’s also up to you to wash your hands frequently, avoid sharing food and drinks, and avoid contact with people who have been diagnosed with the flu. Eating healthy food, drinking lots of water, and getting plenty of rest can also help you avoid influenza. These are general guidelines that can work to prevent a host of other illnesses, as well. However, preventative measures don’t always work. People get sick from the flu all the time. That’s why you have Prime Medical Associates. If you are suffering from flu symptoms, don’t just sit around and wait for them to get worse. Come in to see us so we can diagnose you. If you do have the flu, we can implement different solutions to help you get back on your feet and feeling like your normal self. The solutions that we offer vary based on your medical history and unique needs, but you can rest assured that we will come up with a plan to ensure your speedy recovery.